As of today, it has been six months since my last colour appointment. Six months since I made that fateful decision to grow out my grey. As an experiment, I said. It’ll be worthwhile, I said. Oh, if I could talk to the six-months-younger me now. I’d say, listen, you young, innocent thing. Enjoy those breezy ponytail days when you could toss your hair in the wind without a care and your biggest worry was whether you should get highlights or lowlights, cut your bangs on an angle or straight across. What you think are “bad hair days” are really just “hair different days” – no one says your hair should have body every day! Drink in the compliments about your colour and highlights, even if that colour doesn’t really belong to you. You still wear it well! (And that summer tan helps too!) Straighten that hair, curl it, braid it, pin it, scrunchy it, but promise me, six months younger self, that you will EMBRACE your colourful locks. Fear not what’s ahead (but don’t look forward to it either). I celebrated my six monthiversary by going back to my stylist for a haircut. I thought she could encourage me. I thought a great cut could minimize the doldrums I’ve been feeling about myself lately with these 3″ roots. THEE STOOPIDEST IDEA I have ever had. Spending time in a room full of beautiful people with shiny hair – who strongly desire that I should have shiny hair too – did not make me feel one ounce better, even if my ends are super healthy now. It made me feel much, much worse. It’s not too bad, actually. That’s about the best compliment I’ve had in a long time. Perhaps the best I can expect at this stage, where I now have a literal crown of grey. 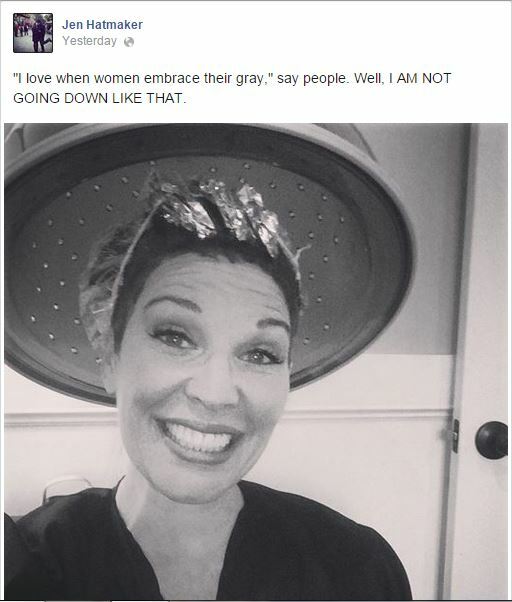 This is the tough stuff of growing out your grey, where you fully surrender your vanity. Months 1-5, we were just playing around, I know that now. I don’t even want to take a #goinggrey selfie. Me not wanting to take a selfie is unheard of. I’ve stopped mentioning it. People are forced to respond when I do and it is becoming increasingly awkward. Most of them don’t care, even if I try making them care. The rest try to find an alternate compliment:your hair could be puke green and you’d still look good (not true); you could be– (don’t even say it, not true); you’re so brave (also, today, not true), etc. Even if I have “supportive” friends, none of us can visualize the end result in order to affirm that I’m moving in the right direction. It’s not like going to the gym where you can guarantee that it’s a step toward a healthier, glowier and possibly fitter you. When people make changes that affect their appearance it’s usually to increase the look of youthfulness, not move away from it. Otherwise, it’s a statement, a counter-cultural, in your face, message. And today I’m too tired to be a message bearer – at least I look it anyway. One of my favourite authors/speakers is Jen Hatmaker (she wrote two books you need to buy right now – Interrupted and 7). I pretend we’re best friends even though we haven’t met yet. (We all have a couple of those in our lives, amiright? Ellen, Kelly Ripa, Jimmy Fallon?) As for me and Jenny, we’re both the same age, we’re both married to pastors (except her pastor husband has tattoo sleeves), we’re both passionate about our faith in Christ, and, hey, we’re even both Free Methodists. And she makes me laugh daily. There are small differences between us, like she is raising 5 kids, 2 of whom are adopted from Ethiopia, had a reality TV show, and is an incredible influencer (pfft). And by the looks of the comments on her Facebook page, she has about 200,000+ other women who feel the same way about her as I do. But here’s what made us extra connected. We both had crooked bottom teeth. I was proud of her, this woman with her wide reach and platform, who chose to just hang out with the rest of us regulars with her crooked bottom teeth. I was proud of us, because no matter what the world told us, we decided our crooked bottom teeth would not only stay, but be of no consequence. Then we had a falling out. She got braces. She got braces just before we turned 40. I didn’t even know I wanted braces all this time till she got them. I had this crazy middle school jealousy about her upping the ante. I thought we were in this together. THEN, just yesterday, Jen posted this. Look at that face. Isn’t she the meanest friend I never had?! Secondly, check out her chompers! Aren’t they magnificent? Thirdly, WHO are the people she’s referring to? I need them in my tribe. Let it be said that, at six months in, I cannot at this point recommend going grey. I remind you that this is an experiment, perhaps one that should come with a warning label: do not try this at home. Join me if you will – although my rally cry has lost some luster – but do it for reasons you can own when you hit the six month mark. Reasons I’d love you to share right about now to boost the morale around this place. In the meantime, I venture on, because vanity is not on the agenda. My hypothesis is that it is all worth it and I have something greater than flattery to look forward to. So I’ll accept the alterna-compliments about my inclusiveness, my problem-solving abilities, my jewellery. (Not kidding, my husband just came in to the room, gave me a kiss and told me I smelled nice.) I’ve left good hair behind and, if I’m honest, I’m secretly hoping for a boat load of wisdom AND good hair at the other end of this. I’ve got no Bible verse to back up this blog post, unless we pull out one of the laments in Psalms and rework some words. There. I said it. Six months bites. I love this comment. You are a beauty, my friend!